There is a Japanese folktale called Green Willow in which a young samurai named Tomodata is sent on a misson by his daimyo, the Lord of Noto, to deliver a message. The daimyo ordered him to ride without fear of enemies, weather or terrain. "Above all, do not look any maid between the eyes. Ride, and bring me word again quickly." This is a portrait of Tomodata. It is an erased charcoal drawing. 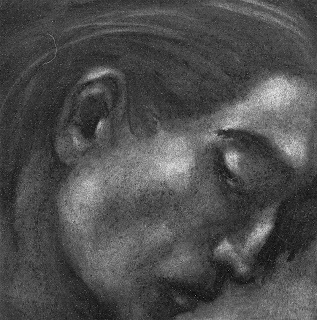 The charcoal drawings, especially this one, are intriguing to view and contemplate. Thank you for sharing the Japanese tale about Tomodata and his love.